The newcomers include Mark Kurtser, Moscow’s chief obstetrician and Vladimir Litvinenkov, rector of the St. Petersburg-based National Mining University and a minority shareholder in PhosAgro. 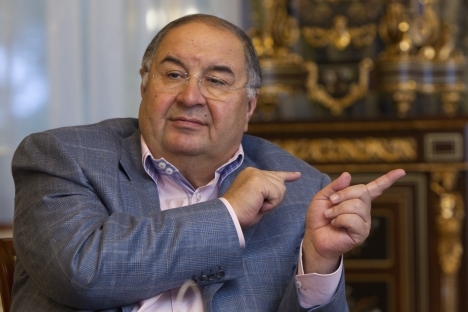 Alisher Usmanov, the owner of Metalloinvest metals giant and a major shareholder in London's Arsenal Football Club, has retained his top spot on the list, even though his fortune has shrunk by $0.5 billion to $17.6 billion. Mikhail Fridman, owner of Alfa Group, has climbed four places over the year to rank second with $16.5 billion, while Leonid Mikhelson, a key shareholder and head of Novatek gas company has climbed seven places on the list to come third with $15.4 billion. The other top ten Russian businessmen include Viktor Vekselberg, owner of Renova Group, who ranks fourth with a wealth of $15.1 billion (up four places). He is followed by Vagit Alekperov, key shareholder and CEO of LUKoil oil giant with $14.8 billion who retains his fifth place and Andrei Melnichenko, chairman of the board of directors of EuroChem mineral fertilizer producer, with $14.4 billion (up five places). Vladimir Potanin, owner of Interros holding company, ranks seventh with $14.3 billion (down three places), Vladimir Lisin, owner of Novolipetsk Steel company, comes eighth with $14.1 billion (down six), Gennady Timchenko, co-owner of Gunvor oil trader, comes ninth with $14.1 billion (up three) and Mikhail Prokhorov, businessman-turned politician and leader of the Civil Platform party, is 10th with $13 billion (down three places). The newcomers to the list are Mark Kurtser, Moscow’s chief obstetrician and the founder of the Mother and Child network of clinics, with estimated wealth of $950 million (112th place), Andrei Rappoport, former Chubais’ deputy at RAO UES of Russia and his current deputy at the RusNano hi-tech corporation, with a fortune of $950 million (115th place), Vladimir Litvinenkov, rector of the St. Petersburg-based National Mining University and a minority shareholder in PhosAgro mineral fertilizer firm with a fortune of $0.5 billion (197th place), and 13 others are new to the list.